Rival factions in the northern provinces of Mexico maneuvered their armies so as to pin their enemies against the border. American forces positioned along that line would unwittingly be anchoring some rebel leader's flank and more than occasionally be caught in a crossfire. 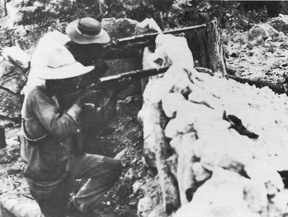 In early October 1914, entrenched rebel forces were besieged by Mexican federal troops in the border town of Naco, Sonora. To protect the U.S. border, Colonel William C. Brown, leading four troops of the 10th Cavalry, arrived on the scene during the night of 7 October. He was joined by six troops and the machine gun platoon from the 9th Cavalry, under Colonel John Francis Guilfoyle who took overall command. Brown deployed west of the town while Guilfoyle took the eastern sector. near Naco, Arizona, on the Mexican border in 1913. On 17 October 1914, two Mexican factions, a pro-Obregon force under General Benjamin Hill and a pro-Villa army under General Maytorena, became locked in combat at Naco, Sonora. On the U. S. side of the border, in Naco, Arizona, the 9th and 10th Cavalry dug in to see that the Mexican forces did not cross the line and violate the U. S. neutrality. From their trenches and rifle pits, the men of the 10th and their comrades from the 9th Cavalry watched the fighting. It was a dangerous business; the Buffalo Soldier regiment had eight men wounded while the Ninth "had some killed and wounded." They also lost a number of horses and mules from gunfire straying across the border. It became a kind of deadly theater of the absurd. One observer noted that the men had "great difficulty ... in holding back the crowds of visitors from Bisbee and Douglas who flocked to see the 'battles,' in automobiles, wagons and horseback." Rebel sharpshooters on the Mexican border. Photo courtesy Col. James W. Fraser. The men were under orders not to return fire, not an easy thing to do when the target for potshooters, and it was a tribute to the discipline of the regiment that they restrained themselves. For their "splendid conduct and efficient service" the men of the 10th were commended by the Secretary of War. 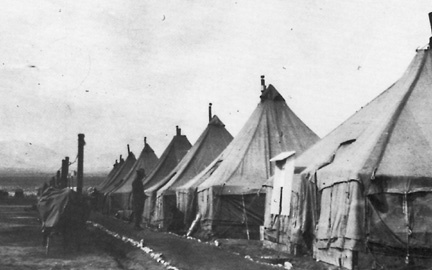 Tents of Troop D, 10th Cavalry, at Naco, Arizona, around 1914 or 15. This troop was commanded by 1st Lieut. Orlando C. "Daddy" Troxel. 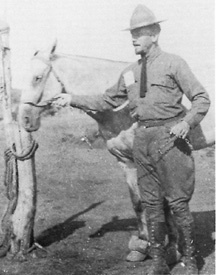 Commanding the First Squadron of the 10th Cavalry at Naco was Major Elwood Evans. Photo courtesy Maj. Gen. John B. Brooks. Colonel Frank Tompkins, chronicler of the Villa campaign, noted the discipline of the troopers. 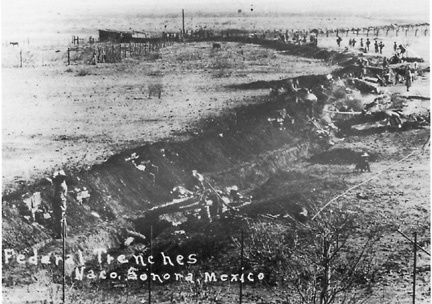 Federal trenches at Naco, Sonora, Mexico. National Archives photo. About 12:25 a.m., on the 17th [Maytorena] made the most determined attack yet made---first from the west, then from the east and lastly from the south, the direction which would send the high shots into our camp an of which he had previously been warned. On the night of the 10th four shots hit the little R.R. station where I had my headquarters; on the night of the 16th-17th, 14 shots hit the same building and I should say that the shots (probably several hundred) dropped in our camp in about the same proportion. Fortunately nearly all men and animals had been moved out for safety but notwithstanding this our casualty list was as follows: Four troopers wounded, one will probably die, and another lose his eye-sight. One horse and one mule killed one horse wounded besides at least two natives shot on the U.S. side of the line. It is a surprise here that the U.S. takes no notice of such an outrageous proceeding. Does the U.S. Government propose to sit complacently by and allow such deliberate firing perpendicular to the boundary that our soldiers are shot in their own camps? This after repeated warnings of the effect of such firing. 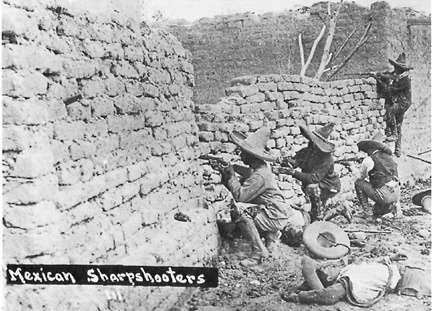 Mexican Sharpshooters. U.S. Army Signal Corps photo. The cavalrymen had a number of skirmishes with bandits during 1915. 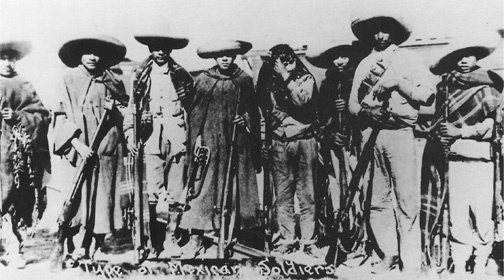 On 22 August, Troop K intercepted a band of Mexican soldiers who had crossed the border to rustle some cattle. The Troop K patrols drove them off with no losses to either side. It was in November of that year that Pancho Villa's "northern division" was soundly defeated by President Carranza's government forces at Agua Prieta. 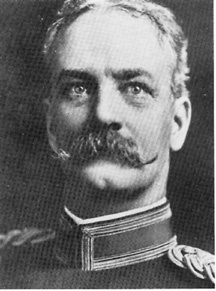 Colonel William C. Brown, commanding the regiment, was there on 3 and 4 November with Troops B, E, G and M. The 10th Cavalry looked on from their blocking positions in Douglas, Arizona, and directed searchlights into the Mexican night, a move Pancho Villa considered as American support for his enemies. The action during the month of November was especially hot. A 24-year-old private from Illinois named Harry J. Jones, Company C, 11th Infantry, was killed on 2 November 1915 by a stray bullet from the Mexican side of the line where the forces of Villa and Carranza were fighting. The U.S. Army camp at Douglas, Arizona, was named for him on 28 February 1916. Then, on 21 November, two privates were fired on by Mexicans while manning an observation post near Monument 117. The next day a camp of Troop F on the Santa Cruz River was fired upon by five armed Mexicans. The detachment returned the fire but there were no casualties reported. Another Troop F outpost on a hill near Mascarena's Ranch was hit on the 25th. In this raid, one Mexican was wounded and made prisoner. 39. Brown papers in FHM files. 40. Tompkins, Frank, Chasing Villa, The Military Service Publishing Company, 1934, 37-8. 41. Brown papers in FHM files. 42. Glass, Edward L. N., History of the Tenth Cavalry, 1866-1921, Old Army Press, 1921, 64-5. 43. Annual Report for the Secretary of War, 1914.